Nova Scotia, Canada -- The Spinney Brothers, "Canada's International Bluegrass Band," are celebrating the success of their latest CD, Memories, released on Mountain Fever Records earlier this year. The CD reached #1 on this month's Bluegrass Music Profiles Top 10 CDs chart and also made its debut on the Bluegrass Unlimited Top 15 Albums chart at #9. The first single, and title track from the project, has had a significant presence on multiple charts spending four months on the Bluegrass Music Profiles Top 30 Hot Singles chart while currently holding down the #2 spot and also climbing to #24 on this month's Bluegrass Unlimited Top 30 Songs chart. The Spinney Brothers have been busy traveling internationally in support of Memories and have performed over 110 shows in Canada and the U.S. this year. 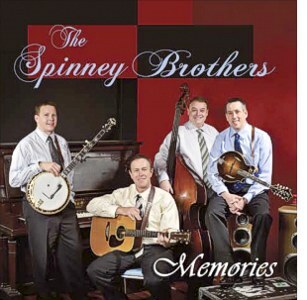 Willis, VA -- Mountain Fever Records is proud to release Memories, the latest project from The Spinney Brothers. The new CD has been shipped to radio programmers and retail outlets and is available worldwide today.